Do you know what is the most famous elephant in the world? The right answer is : Babar the Elephant! Barbar was created by Jean de Brunhoff, the French artist. His had two sons Laurent and Mathieu, who were born a year apart, in 1925 and 1926. Their mother Cécile told her two sons a bedtime story about an unnamed baby elephant and the delighted boys repeated it to their father. Jean named the elephant Babar, improved the story and illustrated it in watercolor. "Le Petit Eléphant" was published in France in 1931 and translated into English as "The Story of Babar" two years later. Both versions, which end with a grown-up Babar marrying Celeste, were instant hits. Mr. de Brunhoff wrote five more Babar books. He did not complete the sixth one and died of tuberculosis in 1937, at age 37. At that time his son Laurent was twelve years old. Throughout his childhood Laurent had watched while his father drew elephants and wrote of their adventures. When his Uncle Michel (the Paris editor of Vogue) asked Laurent to assist with the coloring of Jean’s last two Babar stories, which had been published in a newspaper in black line only, Laurent happily assisted . After graduating from Académie de la Grande Chaumière in Montparnasse, Laurent worked as an abstract artist. After the second World War, when Laurent was in his early twenties, he returned to the family story he had heard as a boy. In 1985 Laurent de Brunhoff moved from France to the United States. He lives now in New York, on East 82 and Third Avenue. Together with his wife Phyllis they discuss the concept for each new Babar book; Phyllis then writes the text while Laurent continues to illustrate. One of Laurent’s recent books, Babar’s Museum of Art ( published in 2003), features his renderings of well-known paintings with the subjects replaced by elephants. 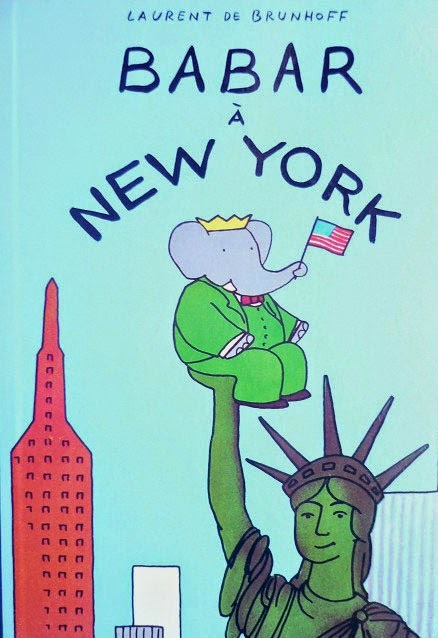 New York-based Mary Ryan Gallery (527 W 26th Street ) represents the original Babar illustrations by Laurent and his father. 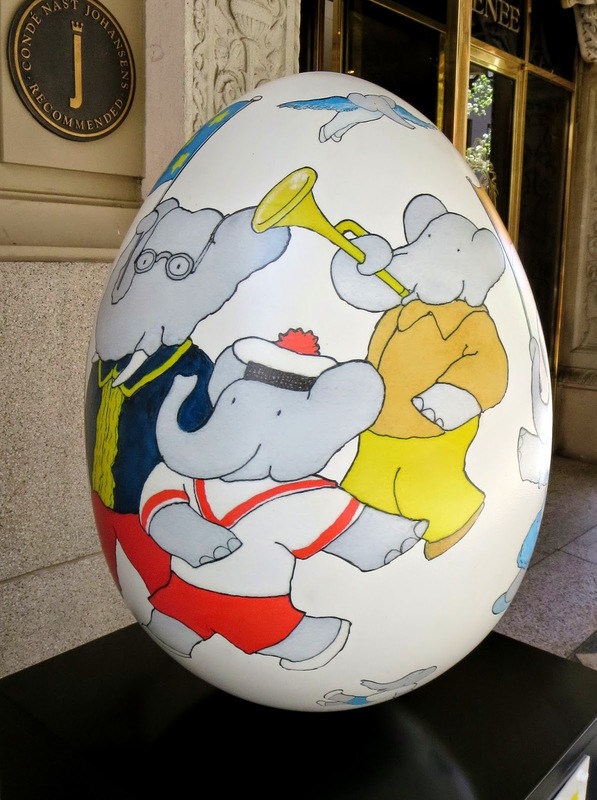 The 30 inch Babar egg sculpture designed by Laurent De Brunhoff is installed on the steps of the Upper East Side hotel, Hôtel Plaza Athénée. There is a Babar Children Package in hotel that includes accommodations for two adults and up to two children, breakfast and Babar Gift Bag with Babar toy, Babar kaleidoscope and “Babar Comes to America” story book. “Babar loves all holidays! I wanted his egg to be festive and celebratory,”the author of the book De Brunhoff said. “I thought of the Easter Parade as I saw it in Fred Astaire’s film and tried to imagine the inhabitants of Celesteville having their own Easter parade. 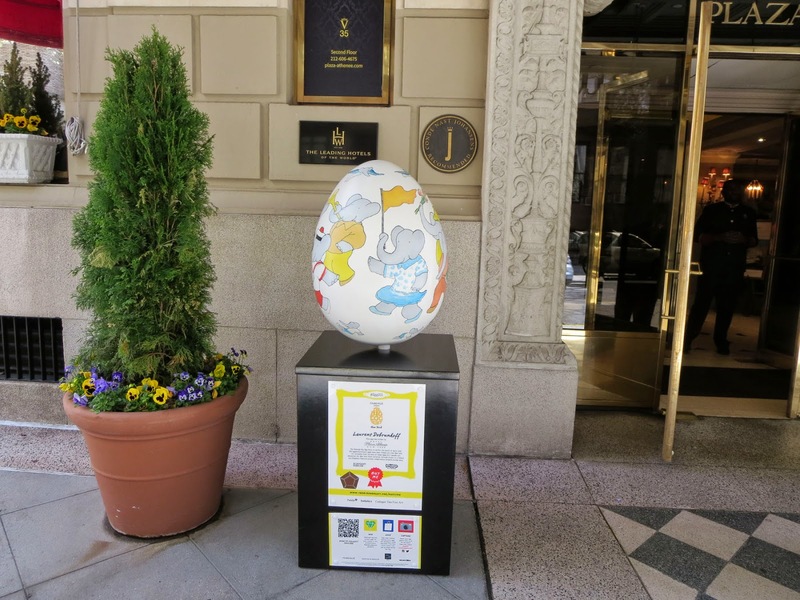 Barbar Egg is among 260 large egg sculptures, designed by globally-renowned artists for Faberge Easter Egg Hunt, placed throughout New York City’s five boroughs from April 1 to 26, 2014.